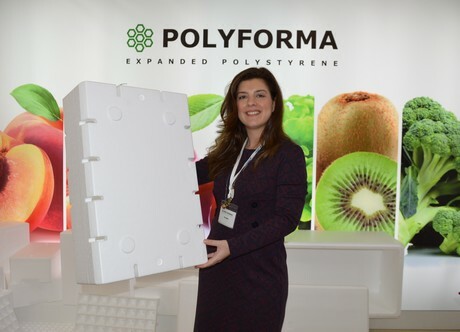 One of the biggest companies in Greece, Polyforma produces food packaging products based on expanded polystyrene. Eps packaging solutions of the company are used for categories ranging from meats to fish, fruits and vegetables. Polyforma was present at Freskon 2017 to promote these solutions. “We’re very active in the agricultural sector. For instance, we’ve introduced seed trays in the Greek market, that are used for the propagation of seeds. And also, we are promoting the new application of fruit packaging in EPS boxes,” says Efi Alevizou of Polyforma. According to Alevizou, expanded polystyrene has a lot of advantages for the packaging of food. The main advantage is that it preserves the product, keeping it fresh and helping it retain its mass and weight during transport. It also lets the product conserve its taste, nutrition and appearance. “Polyforma prides itself on quality and expertise. This can be seen in the market share we have due to the wide variety of products we offer. Most produce has its own unique kind of packaging. For example, our specially designed packaging for broccoli helps the broccoli stay fresh during transport for up to 15 days, whereas normal plastic packaging would only help it stay fresh for 3 days,” explains Alevizou. Founded as a family company in 1981, Polyforma S.A. evolved into a major player providing packaging solutions to Greece and Central European countries like Bulgaria. Through clients in these countries, the packaging solutions of Polyforma are used in transport all over the world. Polyforma’s seed tray solutions help with the development and propagation of seeds. The trays are used to grow small plants at nurseries. 70%-80% of all seed trays that are being used by nurseries in Greece and the neighboring countries, comes from Polyforma. The seed trays are available in a number of varieties. These different types of trays mainly differ in external dimensions, but also in the amount of alveoli holes. The different packaging solutions range from anywhere between 45 up to 336 holes. The company takes great care in providing eco-friendly and sustainable products. Due to the fact that every Eps packaging product contains 98% air and only 2% polystyrene, it is the most environmentally friendly packaging available which is also 100% recyclable. “This material is not the product of trees being cut, but rather is produced from the chemical industry. Polystyrene is also present in plants, coffee beans and cinnamon, which gives it a natural origin. Above all Expanded Polystyrene, it is non-toxic,” affirms Alevizou. 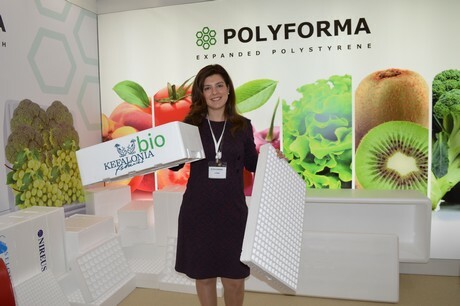 Polyforma’s solutions have already gained a fair amount of recognition in Greece and across Europe, and has been available in Greece for a mere 36 years. “We have increase our presence to the neighboring countries and we are seeking for more partnerships. We do however have a lot of ideas for future products, as the multi-functional nature of the material provides near-endless possibilities. We could for instance apply expanded polystyrene for construction, under floor heating systems or decoration. We are also interested in logistics."